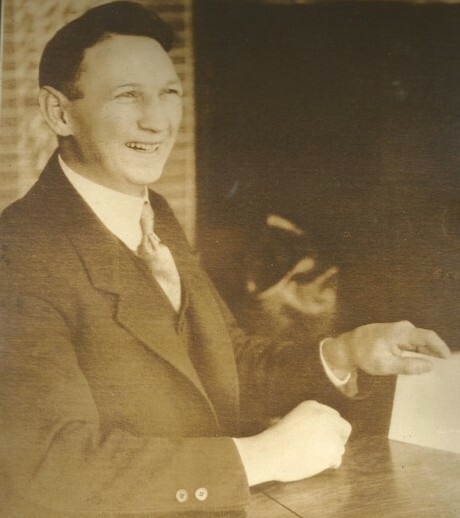 Frank Foyston joined the Seattle Metropolitans after a “corporate raid” on the Toronto Blueshirts and developed into the city’s first hockey legend. Hockey historians rank Frank Corbett “The Flash” Foyston among the greatest hockey players in the first quarter of the 20th century. 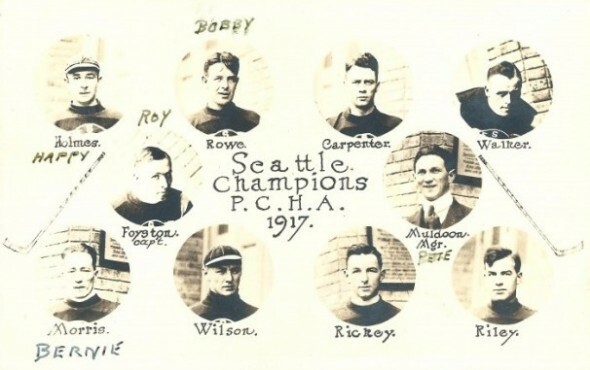 Also among the most decorated athletes ever to wear any Seattle uniform, Foyston enjoyed the sort of celebrity in his time (1916-24) that Russell Wilson does today. Foyston’s popularity stemmed from his exceptional scoring and playmaking for the Seattle Metropolitans, who battled for the Stanley Cup three times between 1917-20, and was enhanced by Foyston’s personal interaction with fans. Off the ice, he owned and operated a high-traffic butcher shop in the Pike Place Market through much of his nine-year playing career. Each off-season, Foyston swapped his stick for an apron and meat cleaver and worked at “Tuffleys Meat Market (owned by Foyston’s father-in-law),” bantering with a constant parade of customers. Foyston ran the place until 1924, when the Metropolitans folded and Foyston left town to pursue his hockey career elsewhere. One of six brothers, Foyton was born in Minesing, Ontario, Feb. 2, 1891. He took up hockey on a frozen pond on his family’s farm, soon graduating to the Princess Rink in what passed for downtown Minesing. At 15, Foyston entered organized hockey with the Minesing Greenshirts and, after a short time, was recommended to Johnny Dyment, manager of the Barrie Colts the Ontario Junior Hockey Association. He joined the amateur club as a left wing in 1909 and quickly developed into a remarkable player. 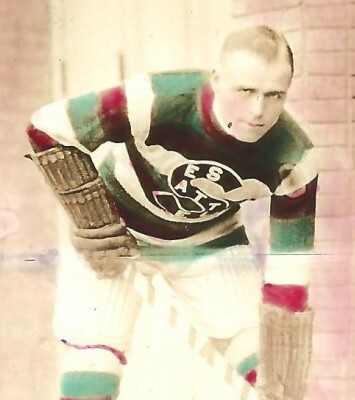 Foyston played three seasons with the Colts, scoring 33 goals, before joining the Toronto Eatons of the Senior Ontario Hockey Association for six games at the end of the 1911-12 season. In those six, Foyston tallied 15 times, declaring himself ready for the professional game. 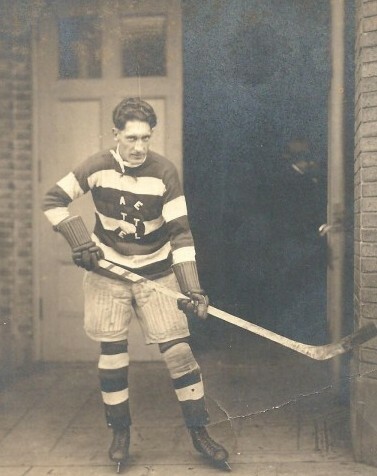 Foyston made his pro debut with the Toronto Blueshirts (forerunner of the Maple Leafs) of the National Hockey Association in 1912-13 and became part of a forward line with Scotty Davidson and Jack Walker (a future Metropolitans teammate and member of the Hockey Hall of Fame). The trio keyed Toronto’s NHA championship in 1913-14 and its subsequent Stanley Cup playoff win over the Victoria Cougars of the Pacific Coast Hockey Association. A year later, on Oct. 12, 1915, PCHA officers, meeting in Vancouver, voted to add Seattle to its roster of clubs and named Pete Muldoon, manager of the Portland Rosebuds, to head the new team. Muldoon’s first task: stock the franchise with players. Keenly aware that owner Lester Patrick had financial difficulties and might disband his team, Muldoon hoped to poach from the roster of the Victoria Aristocrats. But when Patrick opted to field a club for the 1915-16 season, Muldoon was forced to look elsewhere for talent. Muldoon ultimately targeted the Toronto Blueshirts of the rival National Hockey Association for the athletic equivalent of a corporate raid, selecting Nov. 5, 1915 as the day to gut their roster. In one swoop, Muldoon signed defenseman Ed Carpenter, goaltender Harold “Hap” Holmes, forward Jack Walker, forward Carol “Cully” Wilson and forward Frank Foyston. All had figured prominently in Toronto’s 1913-14 Stanley Cup triumph over Victoria and would form the core of Seattle’s 1917 championship team. Muldoon not only pirated a Stanley Cup winner, he acquired three future Hall of Famers – Foyston (1958), Walker (1960) and Holmes (1972) – on the same day. Neither The Seattle Times nor Seattle Post-Intelligencer paid much heed to Muldoon’s raid, both papers giving the story four paragraphs under a one-column headline. To his new quintet, Muldoon added Bernie Morris from the Aristocrats and put the group to work in Seattle’s newest athletic palace, the downtown Ice Arena, on Sixth Avenue due east of where the Fairmont Olympic Hotel now stands. The Ice Arena opened Nov. 12, 1915, a week after Muldoon scavenged the Toronto Blueshirts, with Muldoon, also the facility’s manager, serving as master of opening ceremonies. As The Times reported, nearly 800 people, from the capacity crowd of 2,500, donned skates to try out the new rink. After a couple of hours, Muldoon cleared the ice to make way for a public exhibition. “Pete Muldoon, manager of the Arena, and Miss Margot Kirkreith of Portland, skated through intricate glides of fancy dances to the music of Wagner,” The Times wrote. “Carl Waltenberg, a Russian who performed for years in the Berlin Ice Palace, followed with a clever exhibition of fancy skating. No Seattle scribe did more to promote Muldoon’s new Metropolitans than E.R. Hughes, who wrote a column in The Times titled “Hughes Hugh In Sports.” Hughes devoted considerable ink to touting the team and its players and interpreting the rules of the “new” sport as best he knew them. “The average man on skates has his troubles to keep from falling,” Hughes wrote, “but these speed boys simply cannot fall down. They skate nearly as fast backward as they do forward. They scoot about on one foot, stop dead when going at full speed, and with a whirl start back the other way in a bewildering manner. 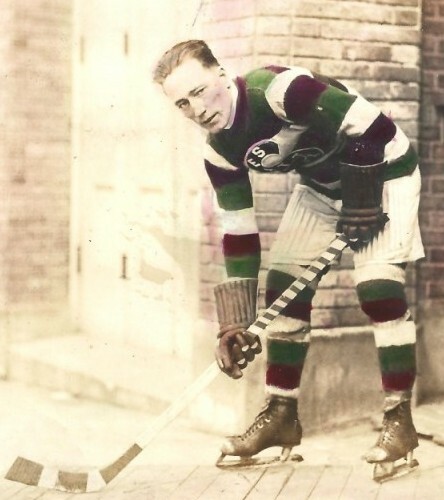 Fans inundated Muldoon with ticket requests, and on opening night of the 1915-16 season, on Dec. 7, 2,500 paid $1 each to watch the Metropolitans, wearing crimson, green and white “barber pole” uniforms, defeat Victoria 3-2. The Metropolitans went 9-9 in the 18-game season, tying the Vancouver Millionaires for second place behind the Portland Rosebuds, who finished 13-5 and earned the right to face Montreal in a best-of-five series for the Stanley Cup. The first U.S. team to vie for the Cup, the Rosebuds fell 3-2 to Newsy Lalonde and the Canadiens. Of more significance, the Rosebuds traveled to Montreal for the five-game set, meaning that the 1917 Stanley Cup, as per agreement, would be played at the home of the PCHA champion. It wouldn’t be Victoria. Lester Patrick folded the Aristocrats, moved them to Spokane, renamed them the “Canaries,” and garbed them in purple and yellow uniforms. It probably wouldn’t be defending champion Portland, either, as its best player, Eddie Oatman, enlisted in the Canadian armed forces. 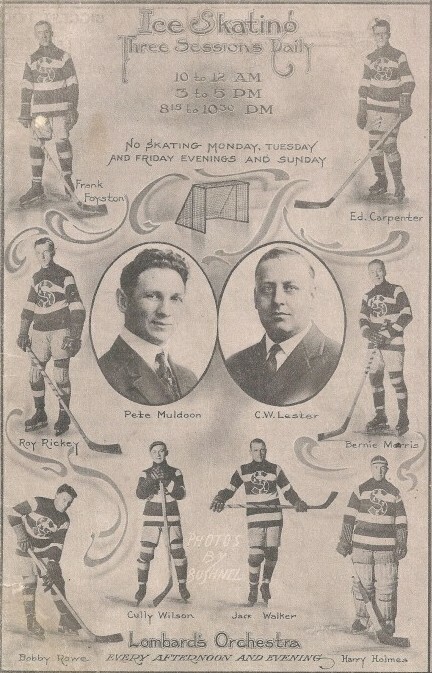 Muldoon figured the Metropolitans had the strongest team in the league, telling The Times that their chief competition would come from the Vancouver Millionaires, who employed five-time PCHA scoring champion Cyclone Taylor and had signed a top wing from the Eastern League, Dr. Gordie Roberts. Not only was Roberts a real doctor, he had once worked as an aide in the New Westminster Insane Asylum. The Metropolitans got off to a bad start, losing 6-2 to Vancouver, and after four games were tied for last. After struggling for a month, the Metropolitans moved into a first-place tie with Vancouver Dec. 30. On Jan. 12, Seattle met the Millionaires again, crushing them 12-3 as Foyston and Morris both recorded hat tricks. That victory enabled the Metropolitans to finish the first half of the season 7-5 and in first place. By March, the Metropolitans and Millionaires ran first and second in the PCHA race and had no more competition from the Spokane Canaries, forced to play their home games in their opponents’ buildings due to a lack of support at home. Prior to Seattle’s regular-season finale at Portland, Muldoon offered a brash prediction. Portland led 1-0, Seattle went ahead 2-1 on goals by Foyston and Morris, and the Rosebuds hit the equalizer late in the second period. Foyston and Morris scored again early in the third period and the Metropolitans won 4-3, as Muldoon had said they would. According to The Times, tickets for Game 1 of the Stanley Cup finals, then referred to as the “World Series of Hockey,” went on sale March 14 at 9 a.m., three days before the start of the series, and sold out within a few hours. The series started badly for the Mets as Didier Pitre of Montreal tallied four goals in an 8-4 victory. But the Metropolitans retaliated for a 6-1 victory March 20 as Foyston notched a hat trick. The Metropolitans continued to pour it on, taking Game 3 March 23 4-1 and Game 4 March 25 9-1 as Morris scored six times and Foyston added two goals and a pair of assists. The Spokane Canaries folded after the 1916-17 season, leaving the PCHA with franchises in Seattle, Vancouver and Portland. 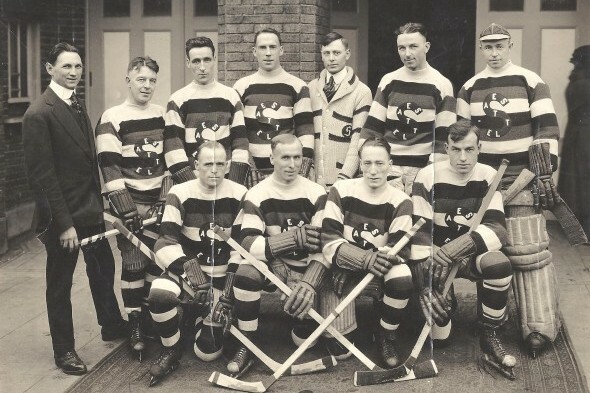 The PCHA remained a three-team league through 1924, when the Vancouver Maroons, formerly the Millionaires, collapsed. At that point, the Patrick brothers threw their support behind the new Western Canada Hockey League and brought the Victoria Cougars into it. Deciding to restrict membership strictly to Canadian-based teams, the Patricks folded the Metropolitans and distributed the contracts of Mets players among WCHL franchises. Foyston remained a Met until the end. Two years after the Stanley Cup triumph, Foyston led Seattle to a Stanley Cup rematch with the Canadiens, also at the Ice Arena. He tallied eight goals in the first four matches of the series, which ultimately had to be abandoned due to the world-wide influenza epidemic. It proved to be the only year in which the Stanley Cup wasn’t awarded. During his nine-year run, Foyston earned PCHA First Team All-Star honors six times and PCHA Second Team All-Star accolades twice. He won back-to-back goal-scoring titles in 1919-20 and 1920-21, and proved his versatility with his selection as a PCHA First-Team All-Star at three positions — left wing, center and rover. 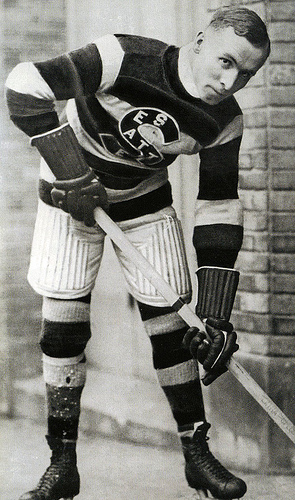 When the Metropolitans ceased operations after the 1923-24 season, Foyston considered retirement, but ultimately joined the Victoria Cougars, where he won his third Stanley Cup in 1924-25, becoming the only player ever to win as a player with three teams. In 1927, as hockey collapsed in the West, the Victoria franchise sold all of its players to the National Hockey League’s Detroit franchise and Foyston went east to close out his career. He played slightly less than two NHL seasons and then joined the Detroit Olympics of the Canadian Professional Hockey League as a player-coach. When he retired as a player, Foyston accumulated 242 regular-season goals and 37 more in the playoffs. After spending a year with Detroit, Foyston coached the Syracuse Stars in 1930-31 and the Bronx Tigers of the Can-Am league in 1931-32. Then he returned to Seattle to coach the Seattle Seahawks of the new, five-team Northwest Hockey League. Following the 1934-35 season, in which the Seahawks went 20-9-3, Hugh M. Caldwell, president of the Seattle Hockey Club, announced that Art Gagne, playing manager of the Edmonton Eskimos, had been appointed to manage the Seahawks in 1935-36, replacing Foyston. The news came as a major surprise. But when the Seahawks dropped seven of their first 10 games in 1935-36, ownership brought Foyston back. They went 17-7-6 over the duration of the season and defeated Vancouver in four games for the NWHL championship. Although the Seahawks fired Foyston again the following season, he elected to remain in the Northwest rather than return to his native Ontario. He signed on as a West Coast scout for the Detroit Red Wings, but that wasn’t his primary source of income. His former teammate, Bernie Morris, who became a hockey referee in the American Association and Pacific Coast Hockey League after his playing days, had purchased a large ranch in Long Lake, WA., near Port Orchard, in 1921, during his heyday with the Metropolitans. Morris was attracted to the Long Lake area while he courted Ethel White, who ultimately became Mrs. Bernie Morris. Morris saw his post-hockey career in farming and purchased a ranch that abutted the lake. Foyston often visited the Morris ranch. In 1926, a ranch adjacent to Morris’ came on the market. Foyston purchased the ranch and installed his wife, Helen, there. Both Morris and Foyston spent part of their offseasons on their ranches and eventually Foyston became interested in raising turkeys, first on a small scale and then on a large one as he transitioned out of hockey. At his peak, Foyston raised about 4,000 turkeys, his toms topping out at 32 pounds and his hens at 21. Foyston lost his wife, Helen, to cancer Aug. 31, 1934. Foyston died at Providence Hospital in 1966, at 74, from a cancer that took him fast. He is interred at Evergreen-Washelli Memorial Park and Funeral Home in Seattle. Great, great story about a player and team few people know much about even though there are as many Mets players in the Hockey Hall of Fame as the Seahawks have in Canton. The fourth Met Hall of Famer should be Bernie Morris, every bit the scorer Foyston was and a guy who missed the entire 1919 season and Cup Final in Seattle because he was in jail for draft dodging. Muldoon, who coached Portland or Seattle to four Cup finals in six years, deserves consideration, too. He was downright fascinating. On behalf of David Eskenazi, thanks for reading! How many chapters about the Mets are in the book? If they’re half as informative as this one, I’m buying! Minor quibble: The Cup also wasn’t awarded in 2005, due to the lockout that negated the entire season.